To be fair, the UP4 has charms beyond the ability to pay for your latte with a swipe of your wrist like the cool kids. It also includes all of the features of the UP3: standard motion tracker, sleep tracker, heart monitor, and food logger, all controlled and managed by the Jawbone UP app. But the integration with American Express is the centerpiece: log into your AmEx account on the app and you can pay "anywhere that American Express payments are accepted." No, it won't work with old-fashioned card swipe machines, like the fancy new Samsung Pay platform. No, it won't work with any form of payment beyond American Express, so if you don't have an AmEx card, there's no reason to splurge for the $200 UP4 ($20 more than the UP3). And unless you're already invested in Jawbone's fitness services, there's really very little reason to go with the screenless UP4 over a comparable Android Wear device - they're getting crazy cheap these days. It launches sometime this summer. 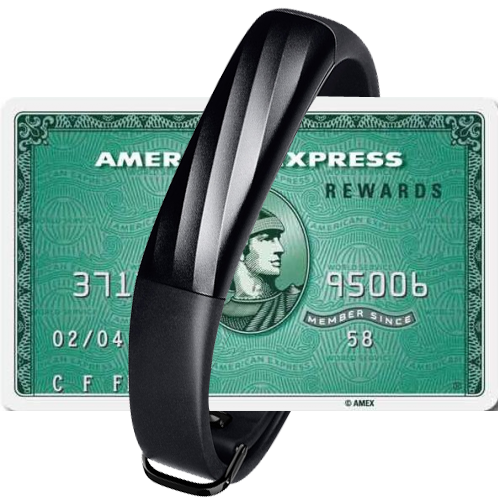 NEW YORK--(BUSINESS WIRE)--American Express (NYSE:AXP) and Jawbone® today announced a new partnership giving eligible U.S. American Express Card®1 Members the ability to tap to pay with the new Jawbone UP4™ fitness tracker anywhere American Express contactless payments are accepted in the U.S. This partnership and product launch marks the first time consumers can use a wearable fitness tracker with an embedded NFC chip for Amex payments, redefining what is possible with a 24/7 activity tracker. The new Jawbone UP4 tracker is expected to be available for purchase on jawbone.com this summer. “We’re delighted to partner with American Express to launch UP4, our most advanced and stylish tracker that’s small enough to wear 24/7,” said Travis Bogard, vice president of product management and strategy at Jawbone. “They provided the innovative and forward-thinking approach needed to create this new experience, combined with a sophisticated and robust payment system, and a wide range of supported merchants." The UP4 tracker features the same slim design and multi-sensor platform as the UP3 tracker, with advanced sleep and activity tracking and heart health monitoring, in addition to enabling contactless payments. UP4 is also backed by Jawbone’s industry-leading UP app and Smart Coach system, which helps people move more, sleep better and eat healthier each day. Card Members who connect a Card to the UP app can manage it at any time in the Payments setting. In addition, Card Members who connect a Card will always be just a tap away from the Amex® Mobile app, for instant access to enhanced account monitoring, servicing on the go, offers and benefits. Paying with the UP4 system is just like paying with a plastic American Express Card. When a Card Member taps to pay with the UP4 tracker, they get all the security, service and benefits of Card Membership. American Express fraud protections safeguard Card Members, no matter how they choose to pay.